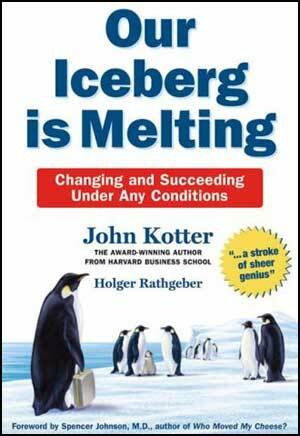 The book of the week was Our Iceberg is Melting by John Kotter. Interesting book written about organizations going through change. I'm not sure why I was attracted to this book, but it may have something to do with the fact I was in Missouri for the last week and a half with temperatures over 100 degrees everyday... and this book had icebergs on the cover. In any case, the book was very good. It is a lot like the book Who Moved My Cheese by Spencer Johnson in the way it gives a fable to illustrate how to change an organization. Change is a very important concept. Understanding it and knowing when to do it are very important as well. It is human nature to resist change. It's in our nature to want to keep the status quo and continue on with what your doing. However, as we all know, especially in recent years, we cannot plan on everything staying the same forever. If you turn a blind eye to what is happening around you you'll eventually have to pay the consequence... your iceberg will sink. This book was focused around a colony of penguins and one particular penguin recognized the signs of the iceberg starting to melt. The rest of the book was about him getting everyone on board with what he recognized and making the change needed so all the penguins didn't go under with the iceberg. After much prodding, the majority of the colony was on board with accepting the change needed. There were some penguins that were always negative and we have all experienced other people that are like that. They just worked around these penguins and made changes anyway. Eventually the penguins moved to a different iceberg and than another until they found the perfect one. The first change was a challenge but moving to another iceberg after that was much easier. 1. Create a Sense of Urgency- Help others see the need for change and the importance of acting immediately. 2. Pull Together the Guiding Team- Have a powerful group guiding the change- leadership, credibility, communication, authority, analytical- these are all important qualities to get into the team. 3. Develop the Change Vision and Strategy- Clarify how the future will be different from the past and how you can make the future a reality. 4. Communicate for Understanding and Buy In- Make sure as many others as possible understand and accept the vision and strategy. 5. Empower Others to Act- Remove as many barriers as possible so that those who want to make the vision a reality can do so. 6. Produce Short-term Wins- Create some visible, unambiguous successes as soon as possible. 7. Don't Let Up- Press harder and faster after the first successes. Be relentless with initiating change after change until the vision is a reality. 8. Create a New Culture- Hold on to the new ways of behaving, and make sure they succeed, until they have become strong enough to replace old traditions. These 8 steps are great! Study them and use them to create change... The book was short and covered the material in a very effective way. If you have any interest in making changes to an organization you are a part of this book would probably be a big help. As always, if you have any questions on the book don't hesitate to ask. I would be more than happy to help anyone that wants it. The book of the week was Flipping the Switch by John G. Miller. I couldn't go much longer without reading another book by Miller. This book is very much focused on the principles of QBQ - Question behind the question. It takes the original book and channels the concept into results in several categories: Learning, Ownership, Creativity, Service and Trust. Let's start with the bulk of my original posting on QBQ!, Miller's original book on the subject. -"Why don't customers follow instructions?" -"Why doesn't anyone else do as much work as me?" -"Why don't I get paid more?" -"How can I serve the customer better?" -"What can I do today to be more effective?" -"How can I be a more effective coach?" -"What can I do to be more productive?" Notice anything about the second set of questions? They start with How and What instead of Why or Who or When. They focus on "I" instead of them, they, or someone else. And most importantly they focus on action. To get ahead in this world there is only one person that can be changed, and that's YOU. If you focus on asking questions dedicated toward making yourself better you will be much better off than someone that is asking questions about procrastination or complaining. Some of the stories in this book were very entertaining. One story that really incorporated the skills I try to push into people's lives through this blog goes like this: A man stopped at Rock Bottom restaurant in downtown Minneapolis. The place was packed and a boy holding a bunch of plates noticed the man hadn't been helped yet, so he took it upon himself to help the man. He asked what the man wanted and the man said he just wanted a salad and a couple of rolls. The boy said it would be right out. And then the man asked if he could get a Diet Coke as well. The boy said they didn't serve Diet Coke, just Pepsi products. The man was fine with this and carried about his lunch. After a little bit of time the man was greeted with an ice cold Diet Coke. The man said "I thought you didn't carry Diet Coke." The boy said "We don't, but they have it at the convenience store across the street". The man asked who went and got it because the boy was way too busy and boy replied "My Manager." There are so many great things about this story. Most people would have said "Why should I have to get a Diet Coke when we have Pepsi?" or "Why should I serve that man, he isn't sitting in my area?" or "Why are we so short staffed?" The boy didn't say any of those things, he just acted. He did what it took to make the customer happy, true customer service. Aside from the outstanding customer service from the boy, I also want to mention the manager. The manager is a true leader. He let his employees make the decision and then he acted. This is a fantastic sign of a successful organization." I really like that story. QBQ! is about personal accountability. If you ask the right questions you will ultimately be more efficient. If you ask the wrong questions you lean toward gossip and the "blame game." Now, watch this video of John G. Miller speaking at several organizations. Please take the time to watch the whole thing, lots of great ideas here. The key is Personal Accountability! 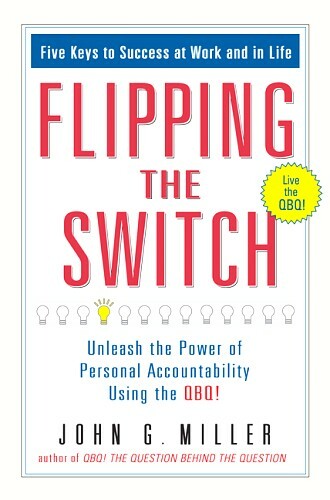 I would say the biggest thing I took away from Flipping the Switch was within the portion on Learning. It is really easy to use, what Miller refers to as, Exclusion. Meaning, that you reject someone's ideas from the get-go because of who they are. They might be a child or a rookie within the company or even a family member. Sometimes you think because you have been involved in something for a longer period of time, you have all the basic answers to problems. It may take some deliberate thinking on your part not to dismiss their ideas, but I bet if you do give a listen to even the most novice people they might have the answer you are looking for. And a lot of the time, the best answer lies with the simplest of ideas. I'm not going to write about every category today because a lot of them are based around some longer stories that taken out of context won't do you much good. However, I encourage you to pick up this book and the previous one if you haven't done so already. Miller is a very bright man and I look forward to reading his next book. As always, if you have any questions on the book don't hesitate to ask. I would be more than happy to help anyone that wants it. 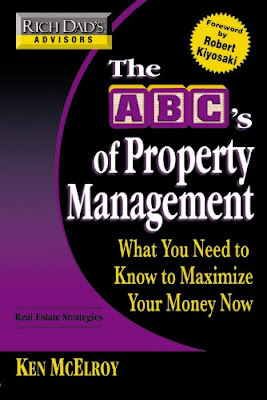 The book of the week was The ABC's of Property Management by Ken McElroy. This is another book from of the Rich Dad series, a series that I am a huge fan of. It's not the first book I've read by McElroy either. He is a great writer and gives all types of great information about the real estate sector. This book was clearly about property management and I found it very helpful. I think the most helpful aspect of this book is that it opens your eyes up to the work that goes into property management. It's a big decision whether or not to manage your property yourself or have someone else do it. The largest incentive to self-managing is decreasing expenses and thus increasing cash flow. However, when you dive deeper into self-managing, you could potentially do more damage and cost yourself more money in the long-run due to lack of experience and know-how. There are several things that could cost you money in the long-run by self-managing. It could be legal fees because you didn't follow the right protocol when evicting someone. It could be maintenance fees because you tried to fix something yourself and didn't have the skills or didn't keep up with preventative maintenance like you should have. And maybe worst of all, it could be the cost of physical vacancy because you don't have the resources to get the right tenant into an apartment within a reasonable amount of time. Property management is a full-time job for people for a big reason- it's a lot of work! One of my favorite investments is cash flowing real estate, but it is important to know when your abilities cease to be effective and where a professional management company should step in and help out. But don't get me wrong, I don't think that property management isn't something that can be done alone. It all depends on the size of the property and your time-constraints. If you have invested in a duplex and you live a few miles away from it, it would make sense to self-manage it. And I think it's really good experience for anybody going into real estate investing. However, if you have a 30-unit apartment building a couple miles away you'll have to really think about the pros and cons of self-managing. If you are like me and have a full-time job it would be very difficult to manage it effectively without exhausting yourself completely in the process. McElroy has a great system for researching a property management company in the book. It has 3 levels of research that I will summarize real quick. Level 1 you will search the internet for the companies and get yourself a good list with any background information you can dig up on them. Then with Level 2 you can visit the companies. Take a look around their operation, ask about their staffing, maintenance connections, and the accounting program they are using and, lastly, ask for a list of the properties they already oversee. Secret shop these properties and look for cleanliness of the property, effectiveness of local management, availability of rental resources... depending on the property, you may have more things to investigate like a clubhouse, a pool, mailboxes, etc. Then with Level 3 you take your data to your team and ask what they think. They could be your lawyers, friends in property management, accountant, anyone that may have some insight on your big decision. A really great resource for real estate is at Ken McElroy's website at www.KenMcElroy.com. It has all types of great sample forms that help give the scope of property management. 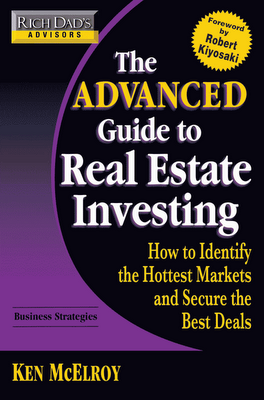 I recommend this book to anyone that is going into real estate investing. It has all kinds of signature Rich Dad tips that all help to maximize your cash flow. As always, if you have any questions on the book don't hesitate to ask. I would be more than happy to help anyone that wants it.